We love seeing what people are making with TAWS.. it's so exciting to see how these little stamps are inspiring you!!! We try to keep track of cards we see with TAWS images while we're "out & about", but if you definitely want to get noticed for your chance to be showcased, there are some helpful tips at the bottoms of this post! 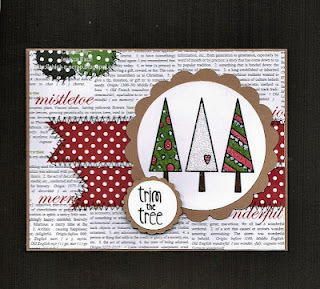 I spied this amazing card by Jessica over on the FB page... this is her first TAWS card - isn't it AWESOME?!? I bet Cheryl will score big with this super fun birthday card for dad! Love the inside, what a terrific idea! And look at this poor guy with the 'mummy pox' by Rose - too funny! Stamping the mummy on dotted paper was a super idea! Jessica's card uses a TAWS Freebie. Stamps sets used in Rose and Chery's cards are Ghoul-Friend and Touchdown. Thanks for stopping by today, and please hop over and leave our Creation Blvd. Showcases some love! Thanks for the shout out! How exciting!! Thanks do much for the shout out!! Had a blast making my Christmas card!! !